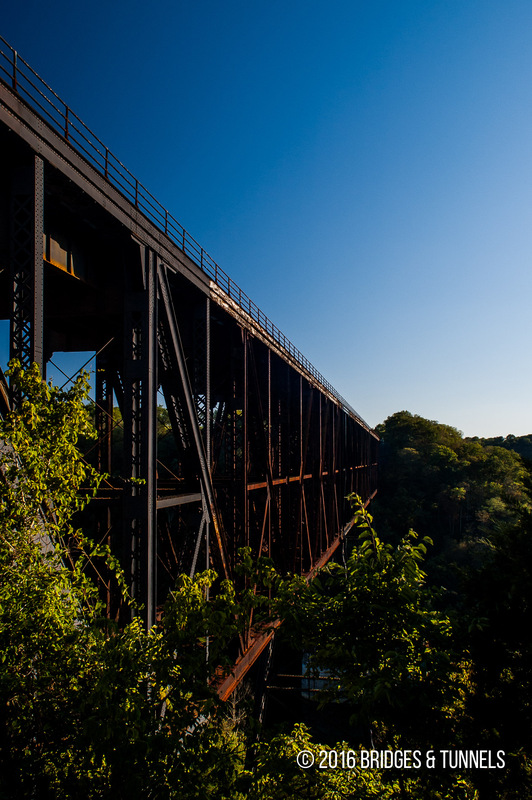 High Bridge crosses the Kentucky River near Wilmore, Kentucky and was once the highest bridge in North America and the highest railroad crossing in the world. In 1851,2 the Lexington & Danville Railroad (L&D) desired a connection between the cities of Lexington and Danville, Kentucky.1 John A. Roebling designed a grand suspension bridge over the deep gorge, although construction was never completed due to financial difficulties brought upon by the advent of the Civil War. Only four sandstone anchor towers were completed. Work resumed after the Civil War when the L&D’s successor, Cincinnati Southern, resumed work on the Kentucky River crossing. 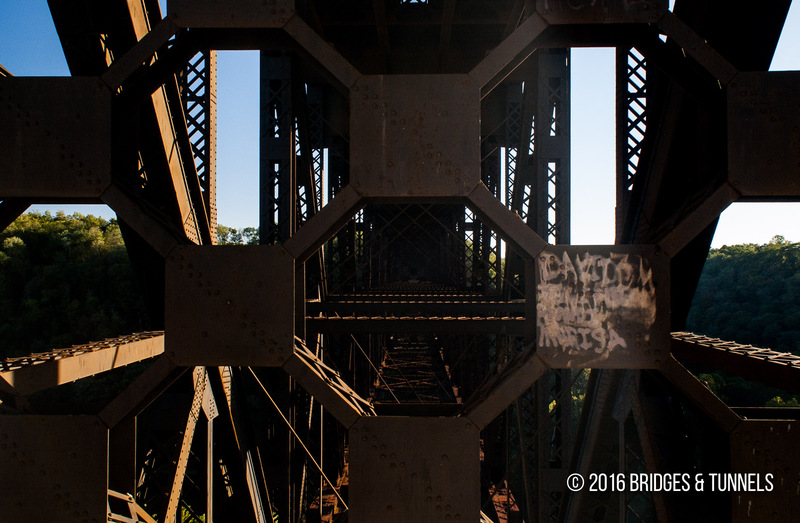 Instead of a suspension bridge, the railroad chose to construct a Whipple deck truss. It hired the Baltimore Bridge Company of Baltimore, Maryland to construct the superstructure, which was completed in 1877 at a cost of $404,856. 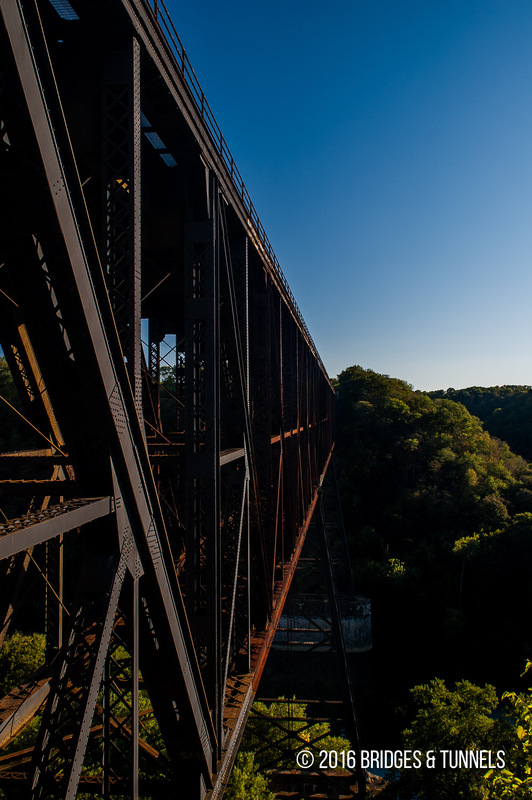 At 1,125 feet long and 275 feet tall, the new High Bridge was the highest of any crossing in North America until 1888 when Young’s High Bridge was built to the north along the Kentucky River; it was also the highest railroad bridge in the world.1 2 3 High Bridge dedicated by President Rutherford B. Hayes in 1879. “High Bridge, Kentucky.” Kentucky Atlas & Gazetter. 27 Feb. 2009 Article. Powell, Tim. “High Bridge History.” WorldTimZone 2008. 27 Feb. 2009 Article. “High Bridge.” Jessamine County Kentucky Tourism.” 27 Feb. 2009 Article.